YUBA CITY, Calif. - A Sikh in California was barred from jury duty because he refused to remove a dagger that his religion dictates he wear at all times, CBS Sacramento reports. Gursant Singh was told that he could not bring the dagger, known as a kirpan, into a Sutter County courthouse in Yuba City as a matter of security. "I either break the law for not showing up for jury duty -- they can fine and imprison you if you don't show up for jury duty -- or I break my Sikh code of conduct, one of the two," Singh said. A kirpan is a 5-inch blade that serves as a reminder to come to the defense of those in peril. Other physical articles of the Sikh faith are the kesh or long, uncut hair that symbolizes the perfection of God's creation, the kangha or a comb used twice a day as a reminder to keep lives tidy and organized, the kara or iron band that is a reminder for restraint in action and the kachera, an undergarment that indicates a soldier's willingness to be ready for battle or defense at a moment's notice. Singh said he would like to be a juror, but would go to jail rather than deny his religious beliefs. He and dozens of supporters demonstrated outside the courthouse this week, demanding that they be allowed inside while wearing their ceremonial daggers. His jury duty was supposed to begin on Tuesday. "I feel very strongly that as a citizen of the United States that I should be able to serve as a juror," Singh said. Sutter County Court Executive Officer Mary Beth Todd said the requirement that Singh remove his dagger was not an issue of religious freedom, but of security. "We do have a no-weapons policy," she said. Court officials are concerned that the small blade would jeopardize the safety of everyone entering the building. "It's important to secure the courthouse," Todd said. "There are many proceedings that go on every day. It can be an emotionally charged environment." 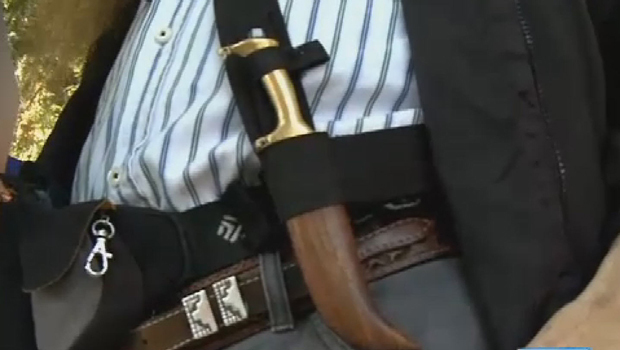 The Sikh Coalition said that many other agencies have made exceptions for Sikhs to carry their kirpan, and that it would expect the same from the court. "A Sikh man with a dagger has never in history gone into a movie theater or anywhere and attacked defenseless people," Jaskarn Singh said.